Like always I want to know what yout think about this makeup. Are you know a monster that know how plays like a human? I love it to read and that quote is from one of my favorite books. I like to think about that. I am sure about something a person is not destroying another person like nothing. I know monsters with flesh and bones. And I am sure that inside each human lives a monster of a demon. Why? I don´t know. But we have to fight against those monsters everyday. Someties is more hard fight against our inner monsters that with against others. And I am talking about something that is real. The Halloween is the time where humans make theirselves looks lke something monstruos for a night but some people is monster under a pretty face and smile during all the year. And those monster are really scary. Ψ(｀▽´)Ψ I cant talk for hours about these subjects. But I want to make this post short. I want wish a Happy Halloween 🎃💀 And enjoy yoursef in this time. Some stories say that the death and ghosts are present during Halloween Night. I don´t know If that is sure but sounds interesting. Trick or Treat? You did a great job! Have a safe and happy Halloween! 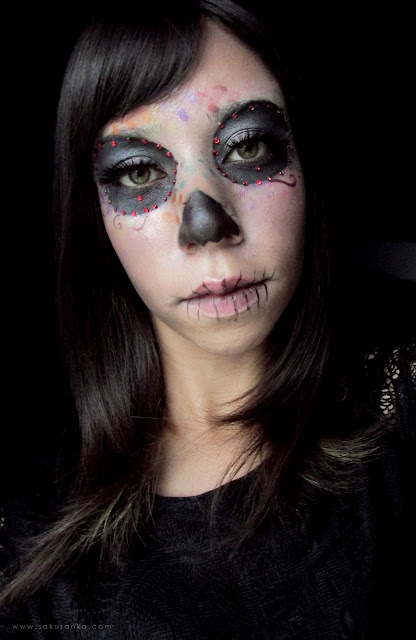 Your skull makeup looks sooo next level!!! WOWOWOWO! U r so talented! This Halloween makeup looks great! Awesome makeup. I do have to agree that I think monsters live within ourselves. It's pretty bad if you think about it but it is true. So cool, love the colors you chose! Happy Halloween! Love your makeup! just brings memories from Mexico! Lover your Halloween make-up look. I did that last year but mine was not as good as yours though. Your skull make-up looks amazing. Hello beautiful, first let me congratulate you for your characterization, it has been super, what you tell us about the internal monsters that we all carry is true, I also believe it, I have also run into flesh and blood monsters, I think the important thing is to learn to have our negative side under control, hopefully it was easy to know that this is not the case because otherwise the world would be better! Kisses. I hope you have had a Happy Halloween!